This entry was posted on January 8, 2013 by Jessica Anderson. Issaquah Trophy & Awards has selected Heroes for the Homeless as the recipient for its Awards for a Cause program during the first quarter of 2013. Since 2006 Heroes for the Homeless has been providing services to the most vulnerable citizens in the greater Seattle area. They serve up to 700 individuals every month, providing food, water, hygiene supplies, clothing, tents, sleeping bags, and information on how to access social services. The HEROES who serve those most in need in Seattle. In addition to donations based on selected product purchases, Issaquah Trophy & Awards will be hosting a ‘Sandwich Making Event’ on Friday January 25th, 5:00pm in their showroom, 1320 NW Mall Street, in Issaquah. At this event a team of volunteers will make 500 peanut butter and jelly sandwiches that will be delivered to Seattle early the next morning. If you'd like to help make sandwiches, please email [email protected] We will also be collecting new, warm socks and travel-sized toothpaste, shampoo, soap and other toiletries. Please drop any donations off at the showroom between 8:30-5:00, Monday-Friday, through the end of March. 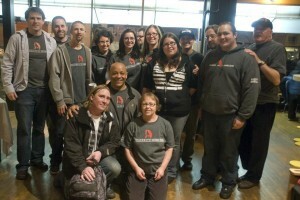 For more information on Heroes for the Homeless, visit www.heroesforthehomeless.org. You can view their video Walking With Heroes to get a better idea of what they do and why we want to help them.